Focus SB Ltd® is a British electrical wiring accessories manufacturer, established for almost 40 years. Industry leaders, our precision engineered switches and sockets are sought after for prestigious interiors projects, both in the UK and internationally. We specialise in the design, development, tooling and manufacture of pressed metal components and standard and bespoke electrical wiring accessories for high end residential, heritage buildings, luxury hotels and yachts. When it comes to electrical accessories what are my options? From sharp contemporary flat designer plates to more traditional semi-raised or intricately detailed plates, we offer a wide collection of styles, materials and finishes to meet a variety of aesthetic and functional requirements. Our plates are not ‘off the shelf’ products and are manufactured to order from solid brass, quality stainless steel or clear acrylic with flame polished edges; metal plates with primed or paintable options. We are one of the only UK manufacturers able to match our toggle and rocker switches to our plate finishes. Customers often specify combination plates - dimmer and rocker combination switches are just one of our specialities! Also, because we manufacture custom wall boxes, this enables clients to specify custom multimedia plates, minimising the number of individual socket plates required for a room interior. Is plate design important to me? Our plates have often been described as ‘wall jewellery’! Details such as electrical accessories are often overlooked until late in the interior design process, which can limit options if style and finish are important to your customers. Getting the right plate designed, manufactured and finished in time for scheduled installation is especially important if there’s a requirement to combine design with advanced functionality, such as home automation or lighting control systems. For those seeking the ultimate discreet plate, our Focus SB Smoothie® developed in collaboration with SHH architecture and interior design practice enables a totally flush installation to a plastered or wallpapered wall, and is the only product of its kind in existence in the UK! Can I match sockets and switches to third party controls? Yes! 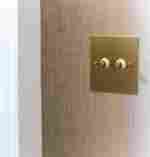 We offer to match existing electrical plate finishes or can manufacture all accessories to the same specification. We manufacture and finish bespoke cover plates for many of the major third party lighting controls systems to ensure continuity of finish throughout an interior. Finish detail is key to the majority of our customers. Whether the aim is to contrast electrical accessories with beautifully-dressed walls or complement furnishing detailing, finishes are integral to the success of an overall interior design. Our plates are manufactured and hand finished in-house, which is important to our customers. We offer tailored services including the design and production of one-off samples specific to a customer’s brief. Our paintable finishes are spray painted for a flawless finish, and can be matched to RAL, Pantone or BS colours, offering valuable flexibility to our customers. Unique to us, we also offer electrophoretic lacquering of polished brass plates providing durability and a hard-wearing finish, ensuring our products keep their appearance over time. We also offer engraving and screen printing. Discover more at Focus SB.